The capsule tubes are designed to store Air-Tite Brand Capsules. Each tube has a small hole poked in the cap to allow air-flow when removing the lid, tubes will hold 20 completely closed capsules. 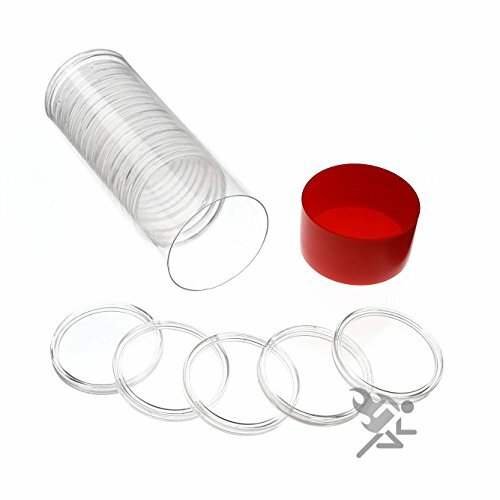 The tubes do not provide any extra protection for the coins, and are only a storage solution. These capsules are Made in the USA from an acrylic plastic with a non-yellowing agent. This process results in a final product that is hard, crystal clear, and smooth to the touch. The cover and base close together firmly to form a perfect seal. The capsules are PVC Free, archival Safe are suitable for extended periods of long term coin or bar storage. *Some coins are thicker than the inside depth of this capsule, but can still be used in this holder. You may experience a small gap between the top and bottom pieces that is about the thickness of a fingernail. If you have any questions about this product by Air-Tite Holders, contact us by completing and submitting the form below. If you are looking for a specif part number, please include it with your message.